With all of the rules and regulations, flying can be a daunting way to travel. When you need to travel with your pet, this can be doubly true. With proper preparation, your pet will be ready to travel safely and with minimal stress. 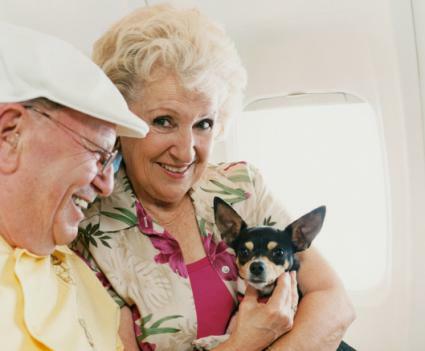 The Federal Aviation Administration (FAA) allows each airline to decide on the specific regulations for airline travel with pets. Your pet may be allowed to travel in the cabin with you, or you may have to buy your pet a ticket to travel as checked baggage in the hold of the plane. For all airlines, your pet will have to be secured in a carrier and remain inside of it throughout the flight. In other situations, an animal can be shipped as unaccompanied cargo. Dogs and cats must be at least eight weeks of age. Dogs and cats must have been weaned for at least five days. Cages or crates must meet minimum established standards. Dogs and cats cannot arrive more than four hours prior to departure without special arrangements. Food and water must be provided frequently, based on the animal's age, with written instructions. Animals may not be exposed to temperatures under 45 degrees without a letter of acclimatization from a veterinarian. Each airline has determined which species of pets can fly in the cabin and which have to fly as checked baggage or cargo. For any pets in the cabin, the pet carrier must fit under the seat in front of you. Pets traveling as checked baggage or cargo must be in a secure kennel that is ventilated, escape-proof, leak-proof, and labeled. The animal must be able to move around. The kennel must be lined with clean and absorbent bedding. Food and water dishes must be secured inside the kennel. Only cats and dogs can travel on American Airlines. Animals must be at least eight weeks old. Pets require a health certificate from a veterinarian dated within 10 days of the flight to travel as checked baggage or cargo. Pets cannot fly in the cabin when traveling to Hawaii or certain international destinations. A ticketed passenger is allowed one pet kennel in the cabin or two pets in checked baggage. Pet kennels in the cabin must be no larger than 19" long by 13" wide by 9" high. Soft carriers can be a bit larger because they can collapse. A soft carrier must be water-repellent. For all kennels, your pet must be able to stand, turn around, and lie comfortably inside. All connections for pets checked as baggage must go through a hub city. Snub-nosed (brachycephalic) dogs and cats are not permitted to travel as checked baggage or cargo. Pets in checked baggage or cargo cannot travel if the daytime temperature at any destination along the route is forecast to be greater than 85°F or less than 20°F. Cats, dogs, and birds (domestic U.S. only) are permitted to travel in the cabin on Delta. Pets require a health certificate from a veterinarian dated within ten days of the flight to travel as checked baggage or cargo. Pets in the cabin must be at least ten weeks of age. The allowable kennel size varies with the type of aircraft. Check the details for your specific flight. No pets are permitted to travel as checked baggage from May 15 through September 15. During these dates, your pet can be shipped as cargo through the Delta Pet First program. Pets cannot travel as checked baggage if the daytime temperature at any destination along the route is forecast to be greater than 85°F or less than 20°F. Exotic species, including household birds, guinea pigs, rabbits, hamsters, and marmots can travel as checked baggage. Other species, such as reptiles, amphibians, fish, or primates can travel as cargo. Cats, dogs, birds, and rabbits at least eight weeks of age are permitted to travel in the cabin on United Airlines. In-cabin travel is not permitted through Hawaii, Australia, or Micronesia. Hard-side pet kennels in the cabin must be no larger than 17.5" by 12" by 7.5". Soft carriers can be 18" by 11" by 11". United Airlines has a PetSafe program is for those pets not eligible to travel in the cabin. Pets require a health certificate from a veterinarian dated within ten days of the flight to travel via the PetSafe program. Snub-nosed (brachycephalic) breeds are allowed with one size larger kennel than for other breeds. Extra ventilation is required, the pet be acclimatized to the kennel beforehand, and water must be provided (but not food). Certain breeds require reinforced crates. No English bulldogs or French bulldogs older than six months or weighing more than 20 pounds are permitted. Boston terriers, American bulldogs, Pugs, and mixes of these breeds are not accepted between May 15 and September 15. During the rest of the year, these breeds cannot fly if the daytime temperature at any destination along the route is forecast to be greater than 85°F. Book direct flights when possible. Choose the time of your flights to try to avoid temperature extremes during the summer and winter. Make sure that your dog is wearing a collar that is fitted appropriately, cannot get caught on the carrier, and is labeled with your contact information. Trim your dog's nails ahead of time so that they are less likely to get caught on the carrier. Let your pet acclimate to the pet carrier for at least a month before your trip. Carry a photograph of your pet with you, or even attach a copy to the carrier. If your travel plans include a connection, ask your airline where your pet can go for a bathroom break. Take some extra bedding with you in case of an accident in the carrier. Since many cats are less accustomed to strange people and surroundings, it is particularly important to give your cat plenty of time to acclimate to the pet carrier. All pets traveling with you in the cabin will have to go through security screening with TSA. This may require that you take your cat out of the carrier. Even if your cat is not accustomed to wearing a leash and collar, TSA recommends that your cat wear one at this time in case he gets startled and tries to bolt. Exotic species: For those airlines that allow exotic species to travel in the cabin, it is important to know what temperatures your pet will tolerate. Rabbits: Rabbits can travel much like dogs and cats. Since most rabbits are used to drinking from a bottle, make sure that your carrier can accommodate this. Birds: Bring a towel or blanket to cover your bird's kennel. Make sure that your pet bird has a way to perch in the kennel. You may need to figure out a creative way to secure a perch in the carrier before you leave home. Many people wonder whether they should sedate or tranquilize their pets for airline travel. The American Veterinary Medical Association (AVMA) recommends against this practice, as there is an increased risk of heart or respiratory problems with these medications. Pets that have been sedated are also less able to keep their balance and are more likely to injury themselves if their kennel shifts abruptly. If your pet does require sedation, some airlines will require a letter from a veterinarian authorizing this. If your pet becomes motion-sick when traveling, your veterinarian may be able to prescribe something that is safe for him to take. This type of medication can typically be given a few hours before arriving at the airport. For pets that routinely take medication, ask your veterinarian if it is safe for your pet to take his medicine during air travel. Make sure that you have an adequate supply of your pet's medication with you before leaving home. A ticket for your pet will vary with each airline. In general, an in-cabin ticket will run about $125 each way. For a pet traveling as checked baggage, rates run around $200. United's PetSafe program allows for shipping large breeds and can be more expensive. Hawaii is a rabies-free state and has special requirements for animal import and export. Anyone who plans to travel to Hawaii with their pet needs to research the exact requirements to avoid lengthy quarantines of up to 120 days for their pet. Advance planning is also necessary because of the testing and vaccination requirements. At least two rabies vaccines need to be administered, a minimum of 30 days apart. The last rabies vaccine needs to have been given more than 90 days prior to arrival in Hawaii. Your pet must have been implanted with a microchip for identification. A specialized rabies test (OIE-FAVN) must be performed. The sample needs to be received by an approved laboratory at least 120 days prior to the arrival date. Once completed, this test is valid for 36 months. Pets require a health certificate from a veterinarian dated within 14 days of the flight. The pet must be treated with Fipronil by a veterinarian within 14 days of arrival in Hawaii, and this must be documented on the health certificate. For owners of exotic pets, it's important to know that certain groups of animals are prohibited for travel to Hawaii. These include some amphibians, all snakes, some pigeons and doves, some finches, some parrots and parakeets, gerbils, and all dog or cat hybrid breeds. For pets traveling outside of the United States, the rules vary greatly. The European Union requires a microchip or tattoo for identification, while the United Kingdom is rabies-free like Hawaii. Research the exact requirements through the U.S. State Department, or contact the embassy of your destination country. The United States Department of Agriculture (USDA)is also a valuable resource. For exotic species of pets, import and export may require a Convention on International Trade in Endangered Species of Wild Fauna and Flora (CITES) permit. This law exists to prevent species from becoming endangered as a result of international trade. Pets that travel internationally will need a special International Health Certificate from a veterinarian certified by the USDA.fipronil Your local vet may be able to do this, but it's important to communicate with your vet ahead of time about your travel plans. Some destinations may require unusual blood tests, a specific brand of microchip, or a vaccination that your vet does not normally carry. Your vet may need to call a diagnostic laboratory or make a special order and will appreciate some advance notice on what is needed. With some planning and preparation your pet will be ready to travel on your next flight, whether you're taking a vacation or moving a long distance. Your pet will appreciate the extra time you took to make him or her as comfortable as possible.